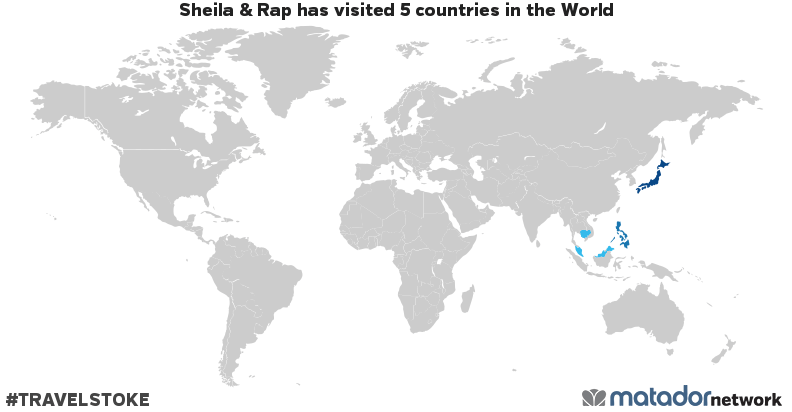 Sheila & Rap has been to: Cambodia, Japan, Malaysia, Philippines, Singapore. Two IT expats based in Kuala Lumpur, Malaysia, working harried all week with one target in mind – getting to weekend and making the most out of it! Laptops. Phones. Notes. Documents. Stuff of the unexciting world we live in most days. Where our inner robots maneuver the mechanism of earning cold cash. Where our asses sit until numbness kicks in. Where our heads mindlessly formulate logic and algorithms. 40 hours of slavery spread throughout 5 days every week, but after this torment, we are free!! We’re two Filipino IT expats based in Kuala Lumpur, Malaysia. Ever since our college days we have tried our best to widen our world. Time was not an issue back then but we are constrained by the depth of our pockets. It’s quite true that as you grow older in this manic society, the inverse relationship of time and money becomes more apparent. Now, being yuppies, our advocate evolves to fulfilling the “work-life balance” most companies promise you when they woo you to work for them. Yeah yeah, we know, why shouldn’t we just use leaves and other corporate slave privileges? Well, yes we can, but we opt to save those for special occasions/seasons (you know, like Christmas to New Year). Weekends, and holidays too if the timing is right, are our only choice. If what a mediocre futuristic movie says is right – that “you could do a lot in one day” – then, 2 days would be more than enough. Great blog guys! Love the awesome pics! I also use Sela theme. Hello, Cheryl! Thank you for taking time to check out our blog. Yes, it’s cheaper and easier to go to places from where we are but we would love to see also the places that you’ve been (at least half of it :D)! Again, thank you and we’re looking forward to your visits here. Hi Sheila & Rap! I love what I’ve read from your blog so far and can’t wait to read more. All the best to you both. 🙂 Happy travels! Hi Sheila and Rap! Thanks for dropping my page. Your blog is an interesting one. Looking forward to read more of your stories. Safe travels! KL is a nice place to be based in 🙂 Easy and cheap Air Asia connections to so many amazing destinations! Lucky you.. I could totally relate to the whole sitting-all-day-in-front-of-a-computer experience. Was also once an expat in Taiwan before I moved back home. 1. Thanks for somewhat linking back to my blog (I realized this when I visited your blog). 2. Looking forward to more of your posts. We (as in my beau and I) had plans of heading out to Mt. Kinabalu. So your blog’s going to give me ideas of what else to visit (I’m not entirely a touristy tourist. I prefer the low-key-high-experiential-value type of traveler). We’re actually planning to go to Kota Kinabalu but it might get delayed. I just had a minor surgery that would require me to live a.. well.. sit-all-day-no-activities lifestyle. Nice Photos you got! Hope to meet you guys in KL. Thanks for following me! Looking forward to reading of your adventures around Malaysia and the region. Thanks for stopping by and I look forward to learning more about your adventures. Hi Sheila and Raphael. I cannot believe there is a Colmar in Malaysia! (I’m French) Why Colmar? Why not Chartres or Saint-Malo! This is so weird! But nice! Thanks for this… “surrealistic” post. Take care. Hi Sheila and Raphael, nice to meet you, and your great blog. The post on Anawangin sure made me want to go to the Philippines. Thanks for following our blog. I hope you enjoy the stories or our journey, both inner and outer. And please do feel free to join in the conversation.